You know those passages of writing that resonate with you, the ones that seem to speak to the fabric of who you are? And as time passes, the words and ideas within the passage remain just as significant, even though they may affect you in different ways? This poem – Desiderata – is one of those pieces of writing for me. During my university years, a poster of the Desiderata poem adorned the wall of my various student-housing bedrooms. Then someone gave me a framed version of Desiderata written in beautiful calligraphy which hung proudly in my real-world-no-longer-a-student apartments. The passage was, throughout these years, my manifesto, my way of approaching life and the world around me. But somewhere along the timeline of moving abroad, then moving back to Toronto and into a place with my now husband, between having kids and changing the décor of our lives, the poem got put away. And I forgot about it. 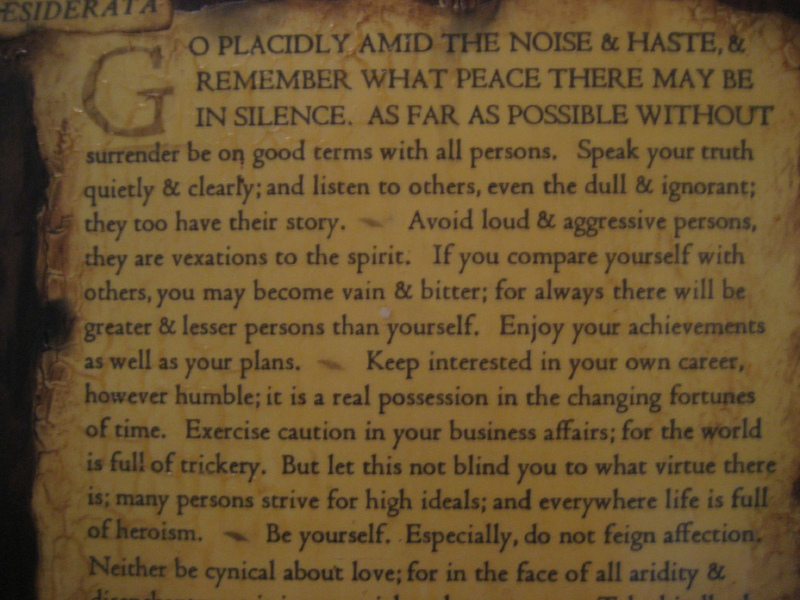 Until a few weeks ago, when I noticed a poster of Desiderata on the basement wall at a client’s house. I was struck once again by its power. It stuck with me all that day, and the next. So much so that I sought it out online and have read and re-read it numerous times since. Rediscovering this passage has affected me so much that, for this week’s Monday meditation, I’m changing things up a little. Instead of offering up a topic or idea to focus and meditate upon this week, I’m inviting you read Desiderata every day. And after each reading, let your heart decide which idea(s) you want to bring into your meditation on that particular day. 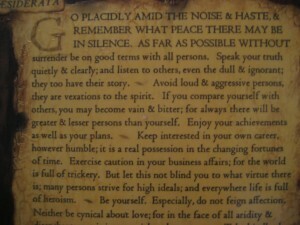 Every time I read Desiderata, it inspires me in some way. It reminds me of the many things in life I hold dear, and of the way I want to live my days. And yet the passage can be broken down into so many deeper and powerful ideas. I hope that as you meditate upon some of them this week, you’ll appreciate this poem as much as I do. And please let me know what resonates with you. May you go placidly amidst the noise and haste this week.